The Russians steal a page from Ray Cummings' Brigands of the Moon and look for rare materials on the moon. Ah, the invisibility cloak once again... well, it doesn't appear because... you know. Invisibility stories continue to appear; when do I get my cloaking device? NASA has released some of their thinking about lunar exploration; read what others thought seventy-five years earlier. Is this the world's first true invisibility cloak? I'm not really sure about this story, but I couldn't resist it. This breakthrough demonstrates that it is possible to build a single material that reroutes light over a broad swath of light wavelengths. Domed Cities - For Earth? Is it really time to start thinking about whether or not we need to start covering Earth cities to protect them (and us) from the rest of our own planet? Should this device be used in the United States? Now you see it; full-size invisibility cloaks are almost within our grasp. 'I donned it and drew its hood, and threw on its current. '- Ray Cummings, 1930. No, you can't see me. Nope, not here. 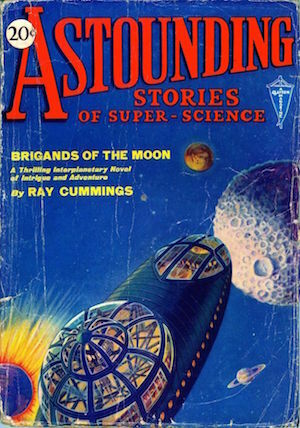 'This asteroid had whirled in from the cold of the interplanetary space...' - Ray Cummings, 1930.